Lucy Bronze booked Manchester City Women a place in the Champions League semi-finals with a vital header to beat Fortuna Hjorring 1-0 (2-0 aggregate). Their prize is a two-legged last four draw next month against the current holders, the formidable French side Lyon. Barcelona and PSG will contest the other semi, with the winners meeting in the final in Cardiff on June 1. City manager Nick Cushing praised his side’s efforts in making it to this stage of the competition, putting out an unchanged side from the team that won in Denmark. Cushing believes his side are the underdogs going into the games against Lyon but insisted there is no pressure on his City side. “We need to draw on our experience of being unbeaten. We’ve been unbeaten now for 21 months - we believe in the way we play. 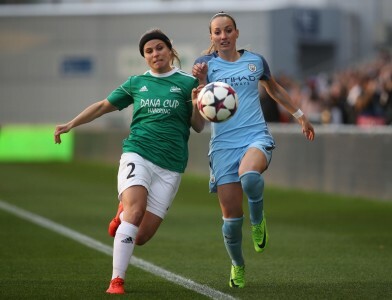 City took a 1-0 lead into last night’s home leg in front of 2,150 fans at the Academy Stadium, and doubled that four minutes from the interval when City right back Lucy Bronze headed home a Melissa Lawley corner. The goal from Bronze, voted City’s player of the match, effectively killed off the Danish champions, who failed to capitalise on several good chances they had during the game. City Women now face an FA Cup semi-final at the Academy against Liverpool on April 17th before their Champions League semi final first leg home game against Lyon on April 22. The return leg will be the following week.